As a recovery advocate and the father of someone in long-term recovery, I've read more books about addiction than I can count. When my son first started struggling with drugs, I made a vow to educate myself as much as I possibly could. Knowledge is power, and I wanted to know everything about addiction. I still do. So I read about it. A lot. 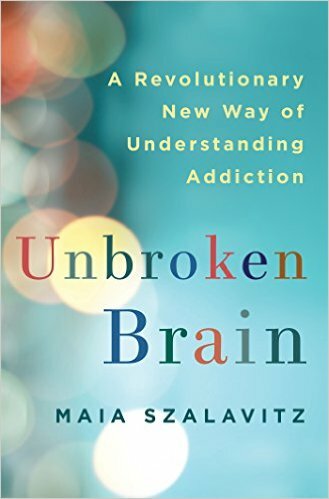 And I can honestly say that Maia Szalavitz's Unbroken Brain: A Revolutionary New Way of Understanding Addiction is one of the best books I've ever read on the subject. Maia Szalavitz is a fabulous writer who has penned a wonderful, very forward-thinking book about addiction. She introduces us to some new theories about addiction, several of which may have people re-examining the way they've thought about one of the most prevalent and deadliest problems in America today. Szalavitz sets out to show that addiction isn't a choice or moral failing. "But it's not a chronic, progressive brain disease like Alzheimer's, either," she notes. "Instead, addiction is a developmental disorder--a problem involving timing and learning, more similar to autism, attention deficit hyperactivity disorder (ADHD), and dyslexia than it is to mumps or cancer." Yes, Szalavitz is blazing new trails here. The author contends that "addiction doesn't just happen to people because they come across a particular chemical and begin taking it regularly. It is learned and has a history rooted in their individual, social, and cultural development." She adds that the addicted brain is not "broken," as many other researchers and writers have suggested. Instead, she says, the addicted brain has "simply undergone a different course of development....addiction is what you might call a wiring difference, not necessarily a destruction of tissue." Looking at addiction as a learning disorder may seem strange to some, but Szalavitz states that doing so "allows us to answer many previously perplexing questions." And in Unbroken Brain, Szalavitz--who is 25+ years in recovery from cocaine and heroin addiction herself--tells us how learning is a part of every aspect of addiction, oftentimes drawing upon her personal experience to illustrate her points. If you or someone you love has been touched by addiction, or if you're just interested in this fascinating subject, I cannot recommend Unbroken Brain highly enough. This book contains a wealth of information, but Maia Szalavitz presents it in an organized manner while writing in a clear and understandable voice. Trust me: You will not be bombarded with a bunch of scientific language that you don't understand. Szalavitz writes in the introduction, "Only by learning what addiction is--and is not--can we begin to find better ways of overcoming it. And only by understanding addicted people as individuals and treating them with compassion can we learn better and far more effective ways to reduce the harm associated with drugs." That is definitely the approach we should be taking with addiction. Hopefully, Maia Szalavitz's innovative new book will be the catalyst for some positive change.